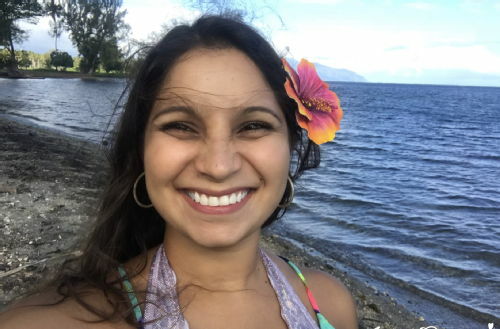 Nathalie Mezza-Garcia, a CIM PhD student, has joined Blue Frontiers as a “seavangelesse” and researcher, working as an advocate for building a green-tech floating community in the lagoon of Tahiti. ‘The Floating Island Project’ in French Polynesia aims to develop an environmentally sustainable floating human community by integrating technologies for energy, waste, water, architecture, smart contracts, block chain, aquaculture and permaculture, with start-up societies and innovative governance models. As developed through Blue Frontiers, this is part of a vision to develop sustainable ocean settlements, as advocated by The Seasteading Institute. Tech ‘evangelists’ are spokespersons for a business or idea, and as a “Seavangelesse” Nathalie will take tech evangelism to the ocean. Nathalie, a political scientist by training, is studying the Floating Island Project in her PhD studies in terms of micro-nations, decentralization, bottom-up organization and self-organizing systems. She is developing a complexity-based theory of heterarchical governance, informed by complex systems theory and her participation in the Floating Island Project. Nathalie will be a spokesperson for the development of sustainable floating cities for Blue Frontiers. Together with Joe Quirk (Seasteading Institute and Blue Frontiers) she will host a podcast about Seasteading and write for the Blue Frontiers blog on aspects related to her PhD studies.